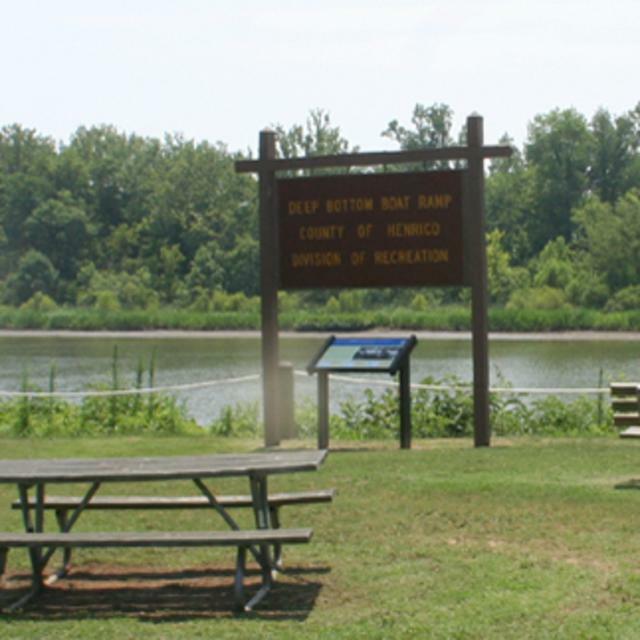 Located at an oxbow of the James River in Henrico County, Deep Bottom Park is a popular place for fish-seeking Central Virginians to launch motorboats, canoes and kayaks. Fishing off the dock is also permitted. Oaks, pines, sycamores and other river-loving trees make their home in this small park. Here the James is wide and tidal, and there is an abundance of aquatic and avian wildlife in the park’s vicinity. Bald eagles, ospreys, great blue herons, and blue grosbeaks are all common up and down this part of the James. Nest boxes for birds such as prothonotary warblers add birding value to this park. For anglers, Deep Bottom is a good launch point for species from largemouth bass to spawning shad and stripers. In addition, the tidal James supports a nationally recognized trophy blue catfish fishery. Big blue cats 30 pounds and up (the river record is 109 pounds) are not uncommon and bring fishermen from all over the country to the James to try their hand at catching one of these behemoths.